The CDA 3D9BL is a sleek and super effective downdraft extractor that's the perfect choice for a minimalist super modern kitchen as it slips sliently away below the worktop when not in use. The 3D9BL has 4 speeds with a touch control glass panel. It also has a 10 minute timer meaning there is no need to turn off the extractor after cooking. If you have low ceilings, a clear and clutter free minimalist look or just don’t like the idea of installing an extractor on the wall or ceiling then a downdraft is perfect for you. 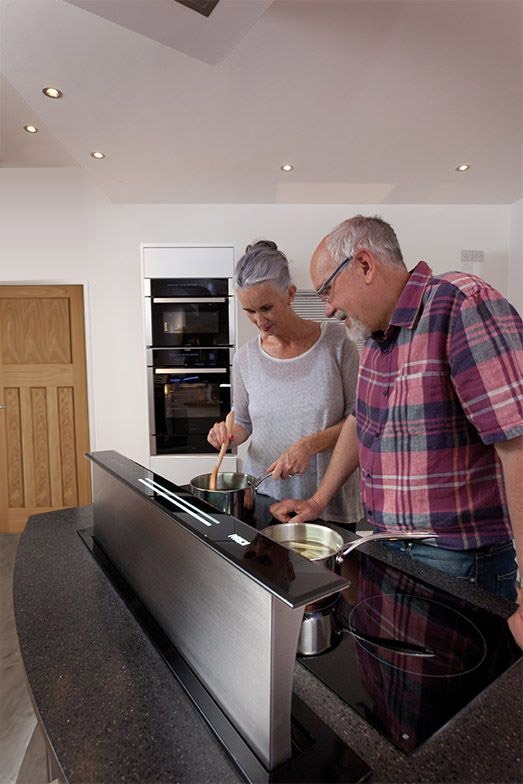 All you need to install a downdraft cooker hood in your home is cupboard space allocated underneath the work surface for the unit to slide away into. All the mechanics will be hidden away leaving you with a sleek and chic glass control panel on your worktop. Many downdrafts on the market come with a separate motor, which we think is a bit sneaky! Ours come complete with everything that you need to install them. All you need to do is order your compatible charcoal filters to complete the job. To find the corresponding charcoal filter code simply click on your appliance product page and telephone our Head Office to order. We will send them out in the post to you as quickly as possible. We have created a range of 3 downdraft extractors that you can choose from, depending on your requirements. They are ideal for traditionally wall-fitted worktops and units or in a kitchen island where you want a clear eye line above the hob surface. 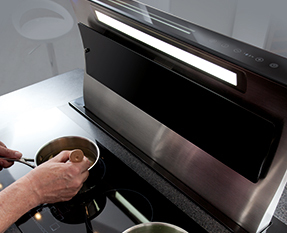 The EDD61 is a neat 60cm downdraft extractor model that can be installed either to the side or at the back of a hob, giving you more installation flexibility. The EDD model is also available in a larger 90cm wide size. The EDD91 is perfect for large hobs or island units and looks beautiful when combined with a matching black glass hob surface. In a curved styling, the 3D9 is also black glass on top but underneath is a beautifully curved steel interior that slides up and out of the work surface with an extra full length light to illuminate your cooking area. We think your kitchen should work around you and if you don’t want to see your cooker hood when it is not in use, then simply press a touch control glass button to slide it down and out of sight beneath your kitchen worktop. Just because they are not traditional in style doesn’t mean that they are not powerful in performance. Our downdraft extractors boast some of the highest extraction rates in the range and can clear a room of smells, grease and steam in just a few minutes. We have also included extra features to boost their performance. Timers provide convenience so that you can enjoy your food while your extractor finishes cleaning the air before automatically switching off and 4 capable extraction rates help you to select the matching air filtration rate to your requirements. Click here to read our buying guide and browse through the features and functions available in our extractor range.